Okay, I'm obviously on a chocolate kick right about now! Please slap yourself you don't immediately run to the kitchen to make these after reading the recipe. They taste like moist, rich chocolate cookies with a sweet & tart little surprise. Make them NOW dammit!! In a blender/food processor: 10 pitted dates, 1/4 cup peanut butter, 1/4 cup hazelnuts, 1 scoop chocolate protein powder, 2 tbsp unsweetened cocoa powder, 2 tbsp chia seeds, 2 tbsp coconut oil and a few cinnamon shakes. Blend on high until its a nice paste and it's all sticky. Wash and cut off the tops of 12 small strawberries. 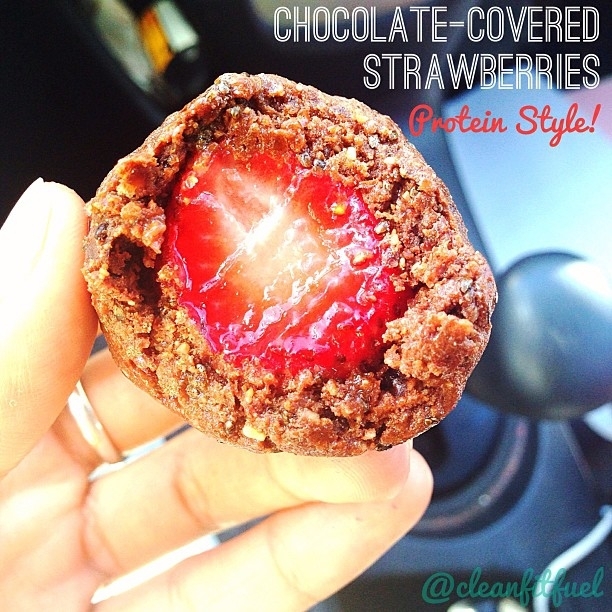 Grab a spoonful of the protein "dough" and press it down on the palm of your hand. Place a strawberry in the middle and wrap the "dough" around it. Roll the ball around your hands to smoothen it out. Repeat for each one of the strawberries. Makes 12! Try not to eat them all at once! !